Whenever worst case scenarios are discussed, sooner or later someone brings up a health related issue, such as stocking up on prescription meds or what to do with a family member who has a chronic health problem. A couple of weeks ago, a reader raised the question of having a diabetic in the family. If someone is insulin-dependent, is there any way to prepare for the possibility that insulin might, someday, be difficult or impossible to find? I posed this question on Facebook and wanted to share some of the answers with you. Of course, before trying anything you read on the internet, always talk with your doctor first. Buy a small fridge or electric camping cooler and a dedicated power supply to keep your stock of insulin from going bad, and stock up. Also look into ways with diet and lifestyle to mitigate and/or lessen the amount of insulin needed. I only have a diabetic dog but when there are chances of losing power I always stock up on those cold packs you put on sports injuries. you know the ones you break and shake. They will keep the insulin cold for quite a while. Check out the you tube videos of The Patriot Nurse. She recommends Dr. Neal Barnard’s Program for Reversing Diabetes and There is a Cure for Diabetes. Cinnamon is a natural way to lower blood glucose levels, as is cranberry. There is an over-the-counter supplement called Cinnergen. It works really well. Mother and I have used it as a quicker way to lower levels, as we’re both non-insulin dependent but use pills. Check out Raw for 30 Days. Look for a meter that uses test strips that don’t expire. Stock up on testing supplies and batteries for the testers. Also, insulin needles. Testing blood sugar can be important for non-diabetics too, e.g. hypoglycemia, pregnant women, etc. I also keep lots of those frozen bags in case of power failure or traveling. Artificial sweetener is helpful. Perhaps stockpiling some of the fast acting and slow acting pills. They don’t replace insulin but could keep a coma at bay. They are not as fragile as insulin. I use the insulin pen. Once taken out of the refrigerator, they can be kept at room temp for up to 28 days, though 14 is preferred. I use them daily, though you could ask your doctor about ordering them for just the winter months if cost is a factor. And the insulin is right in the pen and does not have to be drawn up into a needle. Not all diabetes can be controlled by diet. Type 1 diabetics get NO insulin from their pancreas, thus having to receive the shots. Type 2 diabetics have an under-functioning pancreas and sometimes they can be controlled by diet alone (but not all). 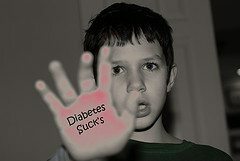 If you have juvenile diabetes, your pancreas doesn’t produce the insulin, therefore you have to take shots to regulate. We did try the zeer pot, (see this article, also) but it did not get down to 55. We were able to stock up on insulin from a Canadian pharmacy without a prescription. My husband is in great shape. He runs and does strength training. He eats good, too. It still doesn’t make his pancreas work. My son is Type 1. I have 1 year supply of insulin and am currently looking into getting this solar generator. It is 1800 watts and is strong enough to run a small refrigerator and other appliances. It is completely run on sun power, is portable and is plug and go out of the box. I would enjoy hearing other ideas too. Maybe we can start our own group. Look into growing stevia… not sure if it helps with Type 1 or not, but it has been used in Japan and South America to help with diabetes. If nothing else, maybe it could help to stretch your insulin supply. Stock up on insulin pens, but be aware! They too have a shelf life with a window. They do not require refrigeration. If your family members are not on an insulin pen, they must change BEFORE any disaster hits. It is extremely dangerous to switch insulin without a medical doctor monitoring the changes. Insulin dependent family members must maintain a routine, even if it is SHTF time. So prepare, prepare, prepare. Going too long without insulin, or taking it too early is a disaster waiting to happen! Start right now, using a schedule that can be kept to in case an emergency strikes. Watch those carbs! And carbs are any starch or sugar. Plan on having more dried jerkys, more dried or canned meats, etc. Beans and rice make a complete protein, but you will have a carb price to pay. So, your meal needs will be different from other preppers. Unless an atomic bomb hits or something totally decimates society-SOME pharmacies and hospitals will still be open. Don’t go in saying that you only have 12 insulin pens left and need to buy up their supplies. The pharmacist will simply sell you one. But, if you say that you are out, most pharmacists can get you resupplied for a week, maybe more. Just remember, when SHTF, we are trying to take care of everyone with very limited supplies. And-no ETA of more supplies arriving. Don’t be afraid to discuss this with your medical doctor, your pharmacist, and your local hospital. I wouldn’t necessarily go down the prepper road-that can lead to questions about your sanity! I would phrase it as, “I want to know, if an earthquake like LA’s in 1993 hits, what are my options?” (Or hurricane, or tornado, or whatever is in your area.) That will make you seem prudent, not nutso. Great advice! Hope it helps with your prepper planning. Look into FRIO products – they are designed to keep insulin cool for up to 72 hours and reactivated using water only!!! I bought a Frio insulin cooling pouch…it works great! My cat is diabetic, and I wanted the ability to keep his insulin cool while traveling (or during power outages). The pouch works through evaporation and uses no electricity at all. You simply soak the pouch in water for a few minutes, and you’re good to go for a day or two. To “recharge” its cooling ability, just soak the pouch in water again. The insulin stays at the perfect temperature. I highly encourage diabetic preppers out there to look into purchasing this product (I have NO ties to the company…just a satisfied customer). All types of insulin, including insulin pens should be kept refrigerated until opened. Once opened, regardless of temperature, they lose potency beginning at 14 to 45 days. Check the manufacturer’s insert to find this information. Insulin should never be frozen or it clumps and becomes unuseable. Temperature for ideal storage is up to 50 degrees (F) which may be achievable in a basement or root cellar. If insulin is stored at higher temperatures, longer than recommended or past expiration date, it gradually loses potency. So, it’s not worthless right away. If you have a glucometer, you can gauge your response and adjust dose accordingly. In many states, insulin can be purchased without a prescription still. Stevia isn’t a treatment for diabetes. It’s a carb free natural sugar substitute. Thank you for this post! It opened up new thoughts on the topic of insulin. DH just became insulin dependent. Now must rethink all of those beans and rice in food storage. Many thanks, Lisa! Thanks, Lisa! this is a subject that is already informing some of my choices. Hawaii Honey, you are SO right, many of the typical foods for storage are not the best choices for a diabetic and for obvious reasons, tend to be carb heavy. Beans don’t give too much trouble, but we’ve eliminated rice altogether in everyday life. I realize all diabetics are different, but I would be interested in hearing about the food choices others are making. For protein, tuna and jerky only get you so far! There is plant call Sunchoke or Jerusalem artichoke it cook like potatoes for a starch substitute and can be eaten raw. I am ordering the root to grow in my garden area. to help I am type 2 so I was concern about finding food I might grow if diet was all I could use to treat it. As a T2, on a pump and Victosa, sometimes the futility of prepping gets to me. Any disaster lasting more than a few months pretty much amounts to a death sentence for insulin dependent d’s! Ah, another “Roseanne Rosannadanna” moment! Thank you for this information. I often get the question about what to do without an insulin supply. As you know, it’s the type 1 diabetics, who produce no insulin, who are most at danger. They won’t be able to live without an insulin supply. And it’s not like, say antibiotics. These people depend on the amount they give having the exact same strength every time. So it’s good to have extra, but watch the expiration dates. I’ve read of some who have recipes for making usable insulin from a pig pancreas but that’s, at most, a complicated technique. And taking the right amount? Next to impossible. Again, thanks for the good info. In the future I will recommend this post to those asking me that question. My Wife is Type 1, Propane is more reliable than solar or wind energy. for something as important and my wife’s life, the propane is a sure thing and i wont have to worry about rainy or overcast days, or a EMP or anything like that, plus it frees up my solar for other things like charging batteries, so on and so forth.. also, buy insulin online to stock up a 6 months to a year supply , and then rotate it out with your prescriptions, always using the oldest insulin first, this way you will not have to continually restock a years worth of insulin. If you do this you will always have a solid year of fresh insulin. Hope this helped and good luck Brothers and sisters. Fuel Consumption: 0.29 gal / 1.25 lbs. They contain inulin, similar to insulin, and are really delicious if eaten raw (properly scaled or scrubbed). Tip: scrub with a handful of sand or take the time to peel it, definite taste improvement. I’m a 57 year old and I was diagnosed with type 2 diabetes 5 years ago, even though I’ve had the symptoms since at least 1994. I spent the 1’st 2 years of my diagnosis half starving myself by counting carbs and also doing alot of research on natural ways to keep my diabetes in check. The past 3 years I’ve continued taking my 1500 mg of metformin, but I’ve also added 5 supplements to my regimen, they are; cinnamon, biotin, chromium picolinate, alpha lipoic acid and zinc. Also in the last 3 years I haven’t used a glucose meter (my doctor and nurses don’t approve). My A1C level has stayed the same–checking it every 3 months, for the past 3 years. Last month at my latest doctor’s visit, I also informed them that along with my regimen and keeping my A1C levels low–6.6, I have been able to eat anything and all I have desired for the past 3 years. Now I know that is kind’a extreme but it shows what and how much you can be able to eat if you’re supplementing with some of the right stuff (what works for me, might not work for you). Also for some added info, I am 6’5″ tall and weigh 345 pounds. So for the pill pushers of the world–stick this in your eye! I’m pretty sure that if I could quit eating so much and go on a diet, I could even quit using my diabetic meds, but I love food. I hope that something of what I’ve related to here can help others to combat their diabetes! I get insulin pen samples from my doctor for free. He has found that the more samples he hands out the more the drug reps bring. If your regular doctor doesn’t have samples ask other physicians you see. Insulin and needles are considered over the counter medications. At this time you can buy both, at least at my WalMart without a prescription. I stock up when I have the extra $24.88 per bottle. Thank you all so much for the info. Over the summer we lost power for five days and thankfully I was able to store my daughter’s insulin at a friends house. Ever since then I have been trying to figure out how to keep her insulin cool without electricity. I have about a three month supply of insulin, but now that I know I can by insulin online (hopefully at a lower cost) I will stock up and purchase the propane operated refrigerator that was suggested in a earlier post. does anyone have suggestions for meters that do not have test strips with expiration dates? Grabbed a box that was a month past due and lo and behold, it would not work. Honey would be the best available natural pick up for low blood sugar issues I can think of. Also stock up. It has no use by date. You dont need a great deal to increase levels. As a type 1 I have a feeling low levels are going to be the least of my problems if the insulin supply dries up..